A Grade II-listed arts and entertainment venue built in 1834 is set to reopen in Gloucestershire. 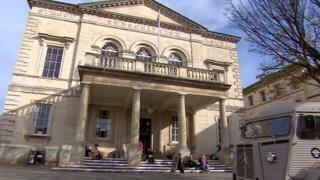 The Subscription Rooms building has been sold to Stroud Town Council for £1 by the district council and will be run as a community-owned venue. It will be leased to a trust which has been specifically set up to run the building. As part of the agreement, the district authority will provide a grant of £230,000 towards operating costs. The district authority has also provided £125,000 as a one-off payment towards repairs to the roof. Stroud District Council Leader Doina Cornell said the funds had been made available to support the new trust through its first year. "We want to see it succeed, hence the grant," she said. Sale contracts were exchanged in January because the district council said it was looking to save money after "a decade of austerity". Stroud deputy mayor Margaret Poulton said the move was important because the Subscription Rooms were "essential to the cultural life in the town." The Beatles performed only a handful of gigs in 1962 outside of the Liverpool and Hamburg areas, but played the Sub Rooms twice that year, once in March and again in September. Stroud Town Council is the new owner but will lease the venue to the Stroud Subscription Rooms Trust, who are responsible for running the Sub Rooms. The trust plans to raise funds to make improvements to the building, including an upgrade to the toilets, bar and cafe. The terms of the new 30-year lease state that the building must continue to be available to the public for cultural use. A previous plan to sell the venue for £600,000 was halted in December when councillors voted to withdraw it from private sale and to lease it instead.